Malachite is a stone from the copper mineral carbonates ‘group. It is green and shows eye or line shapes in the same hues. It was first mentioned by Pline, in 77 A.C but was known a long time ago. Its names comes from the Greek word "mallow" that means "mauve" as a reference to its color that is related to this plant. Other writers think that its name comes from the Greek "malakos" or "soft" because it is an easy stone to carve. It is also known as green chrysocolla, carbonated green copper, ferruginous copper green or mountain green. In Saint Petersburg, you can find a huge chunk of malachite measuring 89 cm long by 50 cm large. In 1835, the Russian minors of Oural found a very high quality malachite weighing more than 260 tonnes. It took them 9 years to excavate this huge rock and almost 12 years to take it to the surface. 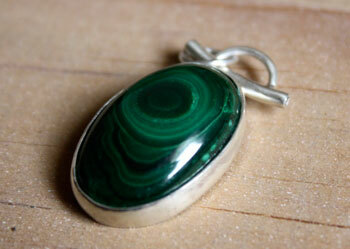 Malachite has always been present in decoration, dyeing or jewelry. It is used as decoration tables, boxes, counters, columns… for example; the world football cup trophy is decorated with two stones of malachite on its basis. You can find some in makeup powders for its antioxidant properties on cells and it helps detoxifying the skin. Malachite is one of the oldest semi-precious stones used by man in decoration. A malachite disc was discovered in Iraq in the Shanidar valley and dates back to the Neanderthal culture and would be 10500 years old. Malachite beads were discovered in the city of Jericho in Israel and would be 9000 years old. During the antiquity, malachite was used as a mineral pigment to make shiny blue green hues. But this painting reacts badly in the long run and tends to fade away. Malachite was sometimes set in the pectorals of Assyrian governors and on the scepters of priests. 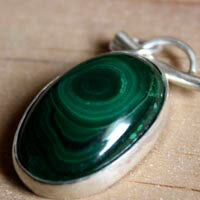 Egyptians were the firsts to intensively use malachite. They would excavate malachite mines from 4000 B.C. It would have been the symbol of joy for them. It was associated with Hathor, the love goddess who was also the goddess of beauty, music, motherhood and happiness. Hathor was also the goddess of minors. 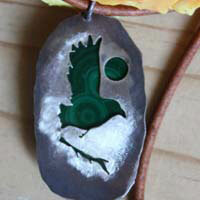 Phoenicians would wear it as an amulet during their maritime adventures. During the antiquity, Greeks and Romans would like this stone a lot and would use it as jewels, eyelid powder and even medicinal powder. Greek generals used to wear it as bracelets or rings to lead their soldiers during the battle. They were convinced that this stone would lead them to the best strategy to win. Greeks also used this stone a lot in architecture. For example, according to the description of Pline, the temple of Artemis in Ephesus (one of the 7 wonders), was decorated with malachite. During the middle-ages, it was thought that the malachite would protect against the evil eye and could cure stomach ache. In some translations of the Old Testament, malachite was the eighth angular stone of the New Jerusalem. In the Christian religion, malachite was associated with Saint Francis of Assisi. People thought that this stone would help to understand the animal language. Since the 15th century, in Switzerland and in French Savoy, people were quite fond of crosses made of malachite. They would give luck to pregnant women and to mothers. People used to think that if you would tie a piece of malachite to the cradle of the child, it would protect him from the evil eye and from nightmares. Malachite was also quite present in the court of the czars, and more especially in the decoration of their castles. It was first used as buttons for clothes and then became more and more important thanks to a mosaic technique that allowed artisans to cover large surfaces with thin layers that would look as just one layer. During the first empire of France, Napoleon owned a table, two candlesticks and a cup made of malachite that were offered by a Russian czar to conclude the Tilsit treaty. Mines: Namibia, Russia, Hungary, Chili, Australia, Brazil, France, Mexico, Columbia, the USA and the Republic of Congo. Malachite would cure digestive infections and would help to transform sugar properly. It would correct thyroid and thymus problems. Malachite would help with insomnia. It would protect the bladder and the pancreas. The malachite would help with eye problems. It would help regenerating the body tissues. It would fight arthritis, more especially for the spine. It would relieve asthma problems. It would help reducing blood pressure. It would relieve travel illnesses such as vertigo and nauseas.